Burgundy wine? Order wines online from Bourgogne France safely! Le Connaisseur sells a wide range of Bourgogne wines from the famous Burgundy region among which Maison Joseph Drouhin, Domaine Bernard Defaix, Domaine René Bouvier, Domaine Laroche, Fanny Sabre, Sylvain Pataille en Domaine Billard. If you are looking for a Bourgogne wine that is not on our website please contact us. 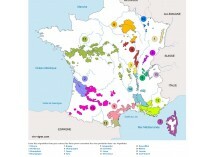 There are 21 appelations in Burgundy: Chablis, Côte de Nuits, Gevrey Chambertin, Clos Vougeot, Vosne Romanée, Nuits Saint Georges, Côte de Beaune, Corton, Pommard, Volnay, Meursault, Chassagne Montrachet, Macon, Mercurey, Givry, Pouilly Fuissé, Rully, Bourgogne AOC and Bourgogne Aligoté. When ordering your wine at Le Connaisseur, you can count on solid advice. Want to know more about wine from the Bourgogne or a winery? Then we will be happy to help you find an appropriate Bourgogne wine. And if you made your choice, you can easily order.